Luz Verde Projects are supported by the earnings of the non-profit hostel, cafe and tourism office. Luz Verde supports local employment and income generation through the three enterprises. It also operates on a non-profit basis, supporting a variety of local social projects with all profits. The administration of the projects is supported from within Cafe Luz y Luna, sharing resources and offices. Many generous donors and groups have supported us over the years, without their invaluable support we could not have made it this far! We Thank them enormously. We are official partners with NGO’s Omprakash in the USA and Sustainability Partners in the UK who receive and process donations on our behalf. Known affectionately as “El Libro Volador” (The Flying Book in Spanish) this mobile library service provides the opportunity for children in rural communities around Esteli to explore the pleasure of reading through interactive programming and the ability to borrow books. This unprecedented access to books encourages and inspires children to be excited about learning, and opens possibilities for their future. Currently the project is working in Miraflor Nature Reserve in the municipality of Estelí, and the communities of El Coyolito and La Concordia, belonging to the department of Jinotega. Future plans for the Library Bus involve the development of community-let educational workshops focusing on creative artistic projects, health and nutrition, as well as non-violence, peer relationships and domestic abuse. More information on the Bibliobus website and Facebook page. An excited team during the inauguration of the bus! Do you suppose they’re reading a driver’s manual? What’s not to love about hanging out with your buddies and some books in the Bibliobus? A volunteer paints faces during a dynamic activity at one of the schools. 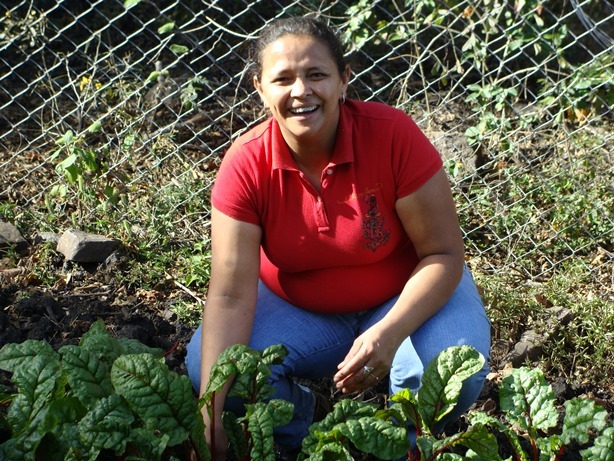 Part enterprise, part social project: the Organic Kitchen Gardens are run by women and their families in and around Esteli providing additional income through the sale of their produce to restaurants in town. The project supports the women of each family by providing seeds, micro-finance for equipment for their gardens and traiing techniques in organic methodologies, and encourage success through micro-credit and commercialization. Participating families are further supported by the guidance of a technician with experience in organic and bio-intensive growing techniques. The produce is purchased by Café Luz and used to compliment our menu. In the future we aim to grow the number of families in the program, as well as expand selling opportunities to other locations in Esteli, and across Nicaragua! Feel free to explore the posts in this blog from 2013 to learn more. Checking in on some young veggies! With the surrounding beauty of Miraflor and Tisey Nature Reserves, as well as the grandiose and relatively hidden gem of Somoto Canyon at our fingertips, Luz Verde works to support local families and community efforts to benefit from tourism in the area. Our tourism office links travelers with community members who act as guides and provide home-stays for those who would like to learn a bit more about the way of life in rural Nicaragua. Luz Verde supports the families in a variety of ways while allowing the families to maintain autonomy and generate income. A daring tourist, Georgie, takes a dive into the blue waters of Somoto Canyon! If you would like to contribute your time, skills or a donation to further support our causes, we would love to hear from you! When you stay with us, you are directly supporting local employment and community-driven development in Northern Nicaragua. Follow the Library Bus Project!